Prof Ango Abdullahi, a former Vice Chancellor of the Ahmadu Bello University, ABU, Zaria and spokesperson of the Northern Elders Forum, NEF, speaks on democracy in Nigeria, the botched and rescheduled presidential elections, and the state of the nation, among other contemporary issues. He warned that there are consequences for rigging elections, saying that the political class, the media and the electorate should be held responsible if the Nigerian state fails. Despite the allegations front and back, what do you think went wrong with the aborted elections last Saturday and what is the way forward? Yes, INEC, to my mind, was on the threshold of history. We thought that the postponement of the elections couldn’t have been done if there was no will on the part of the commission to conduct a free, fair and credible election. There has been this controversy about the sharing of portfolios by the National Commissioners and the hue and cry about one of the commissioners, Amina Zachari, said to be related to the president, but the INEC chairman has decided to appropriate all the major responsibilities of INEC. In so doing, he carries with it the responsibilities of honour, dignity and fairness. I think, someone has to take charge if the bulk drops on your table. Do you think it is right for the INEC chairman to appropriate such major responsibilities in INEC? No, no. But he has to be sensitive to the feelings of the people. The political parties were complaining and despairing and after all when anything fails, there is no national officer to hold, it is the chief executive that will be blamed and held responsible when anything goes wrong. That is why I say that the responsibility is entirely his own. So, the discretion to handle the thing directly is entirely his own. So are you comfortable with the postponement? I am not comfortable with it. The politicians have been on nationwide campaigns, moving from place to place, a lot had been expended and it is sad that at the end of the day it was postponed. And there has been some level of desperation, for example, a governor who is supportive of the president promises to fetch five million votes in his state for the president, are the five million votes his own or that of his supporters? And when you dig deep into the votes cast in the primaries of his party, you will argue with him on how he intends to achieve it. Are you talking about Katsina State? No, I am talking about Kano State. That of Katsina is three million votes. So you can see all the designs. If for example, Kano has five million registered voters and there is a way to show that so, so and so has gotten these votes, then he has gotten only one state. You see from the projections made based on registered voters, based on the outburst from the campaign rallies, based on the calculations of 10 per cent in some states and 97nper cent in others, you can see that it becomes extremely difficult to argue it out and take a firm stand on what to expect or believe, especially when all these sentiments and conjectures are involved. This is even more complex when such permutations do not go with solid facts on the ground. So, when it comes to the possibility of rigging the elections, people use all kinds of devices. You Journalists are guilty, very guilty. (Cuts in…) You are guilty as charged ( General laughter} because journalism which you know more than I do should be a vehicle for social emancipation, should be used to further the interests of democracy and societal ethos. In the democratic world which we are trying to copy, you see the roles journalists play in ensuring growth, progress, and freedom, but regrettably it is not seen here in Nigeria. Why would a president go outside the law to seek correction of perceived ills and the journalists turned the other way. He said those who try to rig should be shot. What did journalists do? No sir, it was captured. It was live on television. We all saw it. But they denied it and you allowed it to go. If you allow such things to go, then you can allow anything. That is my worry. That is why journalists are not alive to their responsibilities. That is why if you want to talk on the failure of the Nigerian state, the first line of guilt goes to the political class. The second goes to the journalists, and the third goes to the electorate. This is the truth, undiluted. The worst thing I have discovered about journalism in Nigeria is that the editorial policies are always related to the proprietorship of the newspaper. This has negatively affected journalism practice. They appear cowed and not sure of their jobs, and because of that, abdicate their responsibilities to the nation and their conscience. So, when they report along this line the reader is confused. For instance, some of them report in favour of APC, twisting facts, some report in favour of PDP breaking all the journalism rules and at the end of the day ,the reader does not know what to believe or who is actually telling the truth. So, who is really telling the truth? You don’t know who is actually telling the truth. It has not helped our democracy in any way. Our democracy will grow when journalists begin to shape up as is being done in advanced democracies. So what are your expectations in the rescheduled elections this Saturday? Well, we are expecting that it will pass away peacefully and creditably. We look forward to the best. I believe we have learnt our lessons with the postponement and all those concerned will do their utmost best. But I am worried about some few developments; this Trader Money issue is disturbing. You give people N10, 000 and collect their PVCs. I think this is not a subtle way of rigging but a brazen way of mortgaging the franchise of the people. I see it as a wrong way of wooing the electorate. The PVC is of absolute importance in the conduct of this election. I hope that the PVCs are intact and reconfigured in those areas where there were problems earlier. This is my wish and I hope it will be done so that the wishes of the people will reflect on the outcome of the elections. Looking at the two big presidential gladiators, the president who is flying the flag of the APC and Abubakar Atiku of the PDP, how do you expect the poll to pan out? 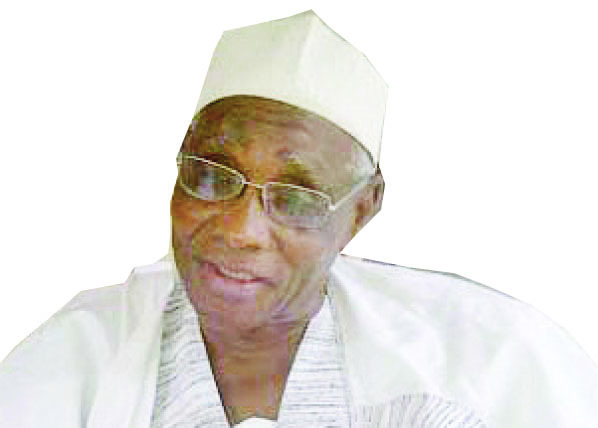 Ango Abdullahi has already taken a position. As a leader of the Northern Elders Forum, NEF, together with Ohanaeze, Afenifere, PANDEF and Middle Belt Forum, we have already endorsed Atiku. There is no going back on that. We gave reasons why we prefer him and we enjoin Nigerians to elect Atiku. Why did you go for Atiku and not Buhari? I am surprised that you are asking me this question. I am sure that you know why we did that. But positions can change anytime. Someone can write a Will today and change it tomorrow if he is convinced over certain issues that he did not know before. So nothing is static, especially in politics. Thank you. I wish to reiterate that my position on this has not changed. I want you to understand the issues at stake. My belief is that the government has failed. The government promised three and half years ago to focus on corruption fight, security and economy. So after three years, where are we on these three issues. This has fuelled resentment of the party in many places and I believe that the feelings of the people have been gauged and they need a change. I have said this in many interviews before, and I believe that there is nothing more to add. I supported this government at inception, but had to change my mind along the line to reflect my convictions and that of the people. But do you think that Atiku is a fit and proper person to fill the gap based on the observed lapses? The issue at stake is that if you are looking for someone with a positive attitude, a person who can galvanize and put together the best of human resources to work in government and for the people, someone who is amenable to advice, you do not have to go far from Atiku. At this stage of our national development, we do not deserve someone who will be creating disunity and tension all the time. Attitude to advice is very important. This is going to be the difference. The quality of the people working in the system and the attitude to advice are what will be different from what we are having now and what we should expect if Atiku wins the election. Those of us in this part of the country know that security is not working here and we feel it everywhere. Insecurity is everywhere here. Some people say they don’t know what went wrong after the initial high hope. I know what went wrong and that is what I am telling you now. There is a need to review the strategies used in fighting insecurity. I think people should not focus so much on parties, but on the individuals involved. I am hoping that the elections will be free, fair and credible and satisfy the people. There are consequences if the elections do not meet the minimum standards of fairness. Not only that it will affect the future of democracy in Nigeria, it will show that the people don’t matter in elections. So, the choice is to go for what is right and damn the consequences, or go for the other side with all the consequences too. This is a burden for the people and a testy time for Nigeria. Like I said, how we handle this election will have far reaching effects on the future of the country and our people. There have been a lot of brickbats flying around between the APC and the PDP on the postponement of the election, accusing each other of complicity. How do you see the scenario? PDP has been blaming the government. In fact people have been caught with bags of already thumb printed ballot papers. It happened in Kano. It also happened in some other parts of the country. So the issue is who is to blame? Of course, the opposition party is the underdog. They do not control the levers of power, especially when it relates to issues like this. The ruling party is in charge of INEC, in charge of security, the police and other agencies and should be held to account if anything goes wrong. The people who should say that this election should be free, fair and credible remain the government. You cannot fault that. If there is a government, then there should be order. And where there is no order, then there is a problem and people will question the function of the government. INEC is an institution of government. The funding and appointments are made by government. So, if government claims not to know why something as big as postponement of the presidential election was done, then we have a problem on our hands because it is difficult to believe. We hope that the election will not in any way be rigged. The hope of the people is that after a cycle of four years they will be allowed to exercise their rights to choose their leaders. When they are not allowed to do that, despair and apathy will come in to alter future elections. Let the majority have their day.